So…it’s time for your wedding hair and makeup trial, and you’re feeling a little nervous. A day of getting dolled up by a professional stylist is a lot of fun, of course, but making a final decision on a wedding look can be overwhelming. While some savvy ladies come to their trials 100% prepared, many aren’t sure what to expect when their appointment rolls around. By following this handy guide, you can strut into your trial feeling totally confident, and leave with a fabulous wedding day style! How long will my trial take? MH artists will always work with you until we find a look you adore. While 2 hours is enough time for most hair and makeup trials, if you feel like you might need longer it’s a good idea to tell your artist so they can plan accordingly. Do you use airbrush makeup? Airbrush is quickly becoming the gold standard for bridal makeup because of its durability and lightweight feel, not to mention how beautifully it photographs! 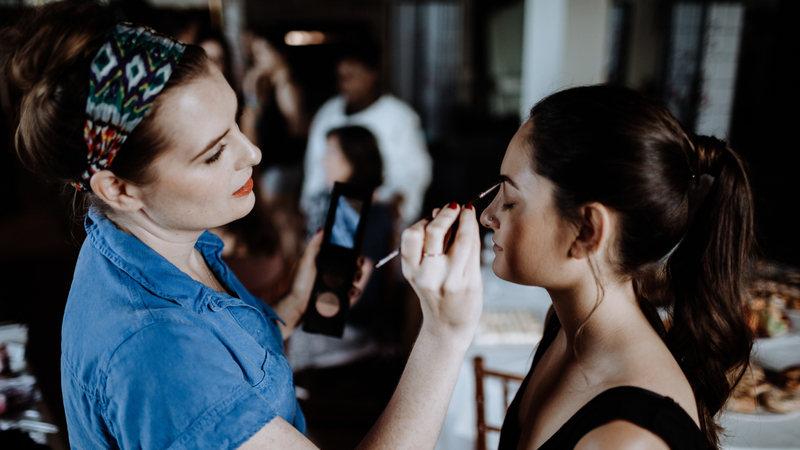 All MH Artists stock their kits with high-quality airbrush makeup to make sure our brides look radiant all night long. Do you provide a touch-up kit? MH Artists always provide brides with a small jar of their lipstick shade and an applicator, as well as extra hair pins and translucent powder if necessary. Bring photos! Most artists are visual, and while you might have a clear idea of how you’d like to look, a lot can get lost in translation from a verbal description. Your idea of a smokey eye or romantic updo might be very different than your potential artist’s, so pictures can help get you both on the same page very quickly. Even if you don’t find one image that perfectly encapsulates what you want, it’s helpful to have a handful of inspirational photos with elements you love about each look. We also love to see your ideas for the rest of the wedding, so any pictures you might have of your dress, flowers, or table settings will help us create a style that ties in with the overall theme of your day. Give us your two cents. Don’t be afraid to speak up! A good artist should be able to take suggestions and strive to realize your vision without taking it personally. It’s extremely common for a bride to bring in a photo of a gorgeous look, but not feel like herself once we try it. If you let your artist know how you’re feeling every step of the way, they can work with you to find the look you love. It’s your day—we’re just here to make you feel your best! Trials might seem a little daunting at first, but by asking the right questions, bringing photos, and speaking your mind, you can achieve your dream bridal look (and meet a cool artist along the way). Now get over to Pinterest and find some inspiration!